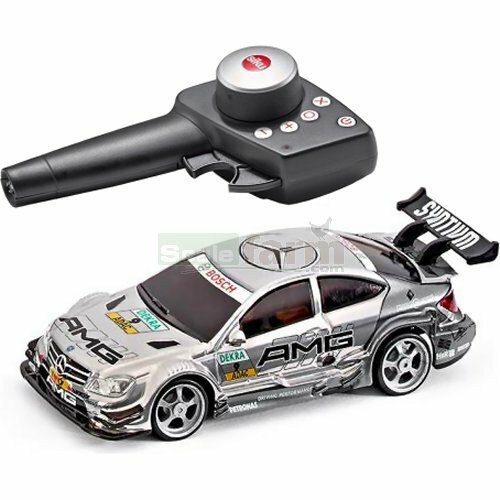 On your marks... DTM Mercedes AMG C Coupe racing car with 2.4 GHz pistol grip remote control. Proportional and precision steering makes it suitable for any race track. Digitial proportional speed control with one drive and one servo motor. Bright LED headlights and rear lights, three different tyre sets and a 4-gear shift to let you reach top speed. To ensure the racing models also have perfect traction, the full-suspension body with hard-wearing zinc diecast chassis has a fully electronic differential gear for lightning fast, breathtaking handling around curves just like the real-life spectacular endurance series. But the intelligent drive system means this car does even more. Race free of lane markings for a unique and challenging racing world with enhanced play features. The body has a discreet colour sensor function to give a clear indication of the vehicle's race position. Set includes: car (SIKU 6834), battery (SIKU 6805), USB charger (SIKU 6806), pistol grip RC handset (SIKU 6899), interchangeable tyres (SIKU 6807).